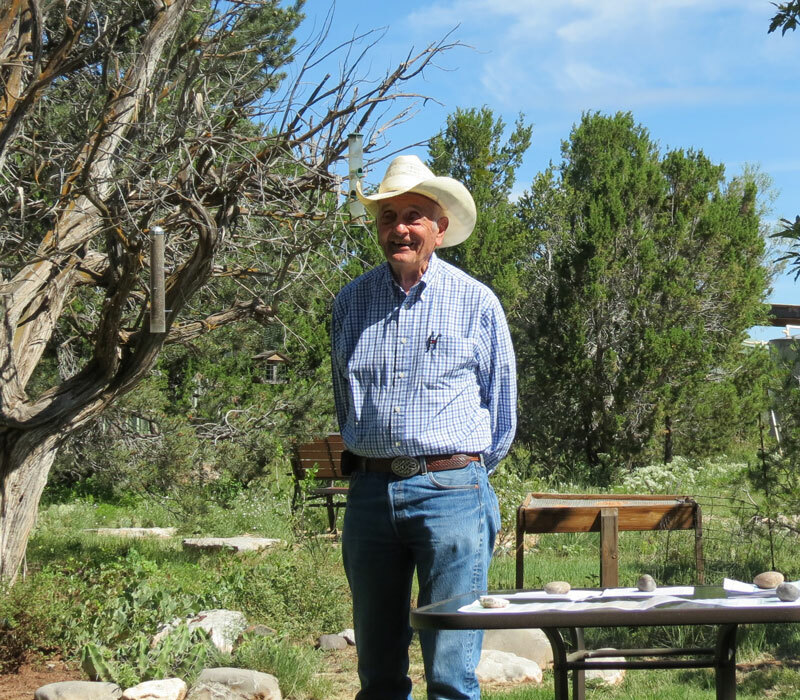 Bill, who has been keeping records on the 47 nesting boxes on his ranch at the base of the Manzano Mountains for 18 years, passed out a graph to the assembled Thursday Birders who gather each year at the end of July to learn about the current year’s cavity nesters. All but one of his boxes was occupied – 38 housed Western Bluebirds. Other cavity nesters occupying the boxes were Ash-throated Flycatchers and one Bewick’s Wren. Although the count is still evolving, he estimates that by time the nesting season is over, 170 bluebird chicks will have fledged. 125 have already fledged and there are 10 eggs and 40 chicks still in the boxes. This will be the 5th highest count since 1999 when he began record-keeping. The drought-year of 2011 had the lowest count of only 68. “During the heatwave in June, we had temperatures in the 90’s for 4 – 5 days just like we did last June,” he explained. “We lost 25 newly-hatched chicks.” A number of the parents immediately began to nest again as did many of the pairs whose chicks had successfully fledged. 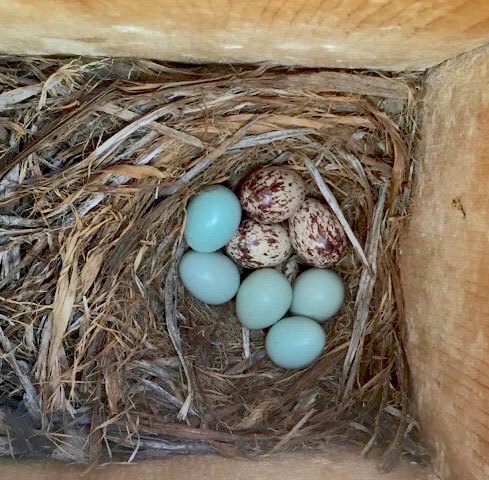 Bill explained that there is stiff competitions for nest sites and that Ash-throated Flycatchers, who arrive after the bluebirds have started nesting, will sometimes try and take over a nest – building their own nest on top of bluebird eggs, or even newly-hatched chicks. “I watched one box where the two species traded control several times and at one point had both types of eggs. Sadly, only one egg hatched, neither pair of parents assumed feeding duties and it died. “Can you tell whether pairs will use the same nest box each year?” someone asked. He thinks that some do, since many stay year-round and use the box to roost during cold winter nights. There are also three boxes that consistently have albino eggs, probably indicating that they are laid by the same parent. “Although the eggs are white rather than bright blue, the chicks are always normal,” Bill clarified. Over the years, Bill has perfected the design of his boxes. The tops are deep to prevent predators from being able to reach through the hole and down into the box to retrieve an egg or chick. The tops swivel to one side so he can check them without disturbing the nesting mom or allowing chicks to fly out before they are ready to fledge. “We haven’t lost a single bird to predators this year,” he stated proudly and held up a copy of the hand-out for his box design he offered to anyone who was interested. He and his wife clean every box in early spring to prevent disease. Bonnie Long, one of the Thursday Birders who lives nearby, shared her experience during the heatwave. She has 16 boxes on her property – 12 were occupied. 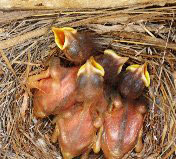 In one of her boxes the less-than-a-week-old nestlings died. “At that stage in their development,” she relayed, “they can’t regulate their body temperature and the parents aren’t able to provide liquid for them,” she told the group. In another one of her boxes with 3 Ash-throated Flycatchers, one died, but she was able to rescue 2 and take them to Wildlife Rescue. “They are thriving and ready to be released,” she said gleefully. After the presentation, several in the group had the opportunity to see one of the nest boxes up close and peer inside to observe the young chicks. Others wandered around the property checking out the other birds. And then it was time to caravan down the road to Bonnie’s house for our annual summer barbecue. 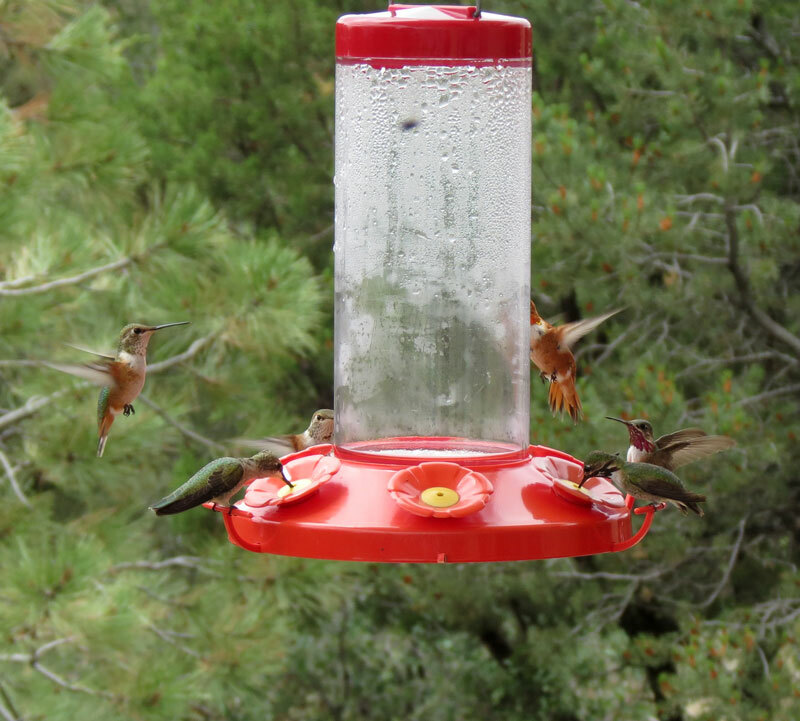 We feasted on wonderful food and enjoyed the hundreds of hummingbirds buzzing in and out of her 14 feeders. So sorry I missed this trip! Sounds like a fun and informative time! Very informative!! Bill Simms is quite the record keeper! any news on Cooper’s Hawks? 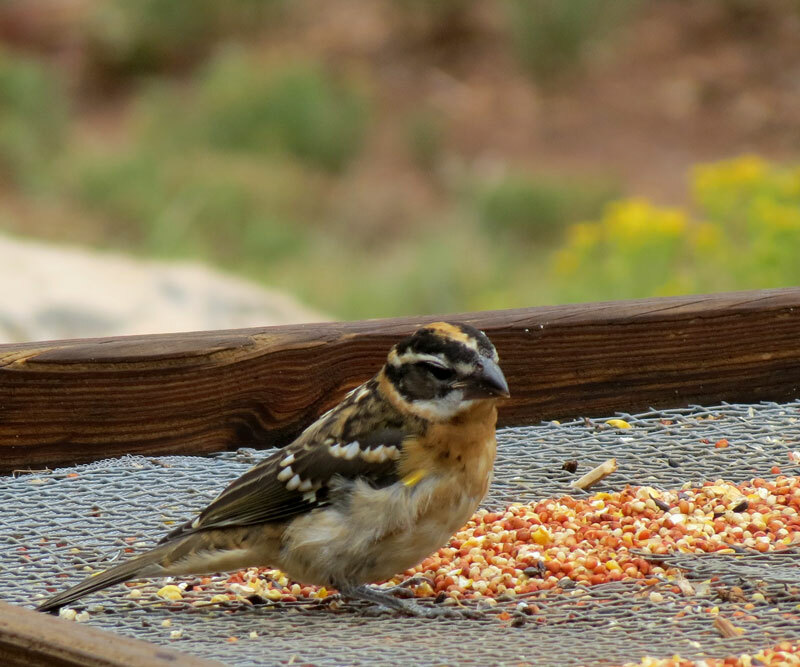 I live in the city (ABQ) and have had a few banded (green and red) visit my bird bath. Thanks.